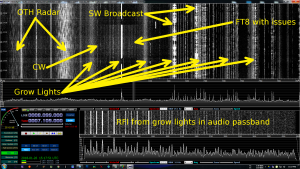 This is part II in a series of articles which will cover how I interpret and use SDR captured spectrograms as they relate to my RFI mitigation efforts. See Part I, Using a SDR as a Site Survey Tool for how I setup and use the SDRPlay RSP1 as my SDR of choice, while using HDSDR as the radio control program. The concept was to view my RFI environment as a whole, not in real time, but across long periods of time, and very wide frequency spans. Once you have looked over part I, and part II, take a look at the RFI Samples page. This page presents various forms of RFI so you might be able to tell what is causing your RFI issues. Real world examples of RFI will be used here showing how I can infer what appear to be disparate RFI sources, as related sources. Part I covered my choice, installation and setup of HDSDR, and an SDRPlay RSP1 SDR for use as a site survey tool. Once I had HDSDR installed, I immediately connected it to my Hustler 6BTV antenna. I was rewarded with a very good-looking spectrum display of the Forty Meter band. After some initial adjustments I discovered that the SDRs have such a wide bandwidth that antenna bandpass can become a major issue. Fortunately I have a T2FD antenna, which I use as a test antenna because it is reasonably flat across the 3 through 30 MHz. part of the spectrum. The antenna is basically a dummy load at the end of a coax section. It is flat because it is not resonant. That also means that it has loss as compared to a dipole but the SDRPlay has far more gain than needed to display HF signals using just about any antenna. This solved the roll off I was seeing when using a resonant antenna. Twenty Four hours of RFI on 80 Meters. Click the image for expanded view in a new tab. After setting up HDSDR to show the entire 40 Meter band, using the T2FD antenna, I was rewarded with the image you see above. Note that across the bottom of the signal display you see a very flat noise floor. This is important because you want to show the RFI across a large amount of spectrum, and if your antenna is not flat, then your display will not show the RFI well. Taking the time to get a flat noise floor, even at the expense of signal strength is important. You will have to play around with the LO frequency, the display zoom, and the position of the displayed frequency range to get a flat noise floor. You want your target range to be about half of, the total SDR bandwidth, so if you want to show a 5 MHz wide section of spectrum, you will want to select 10 MHz. or so as the bandwidth for the SDR to display. You will then need to zoom in and center your target frequency range, using the zoom, and position controls. I move the LO frequency out of the visible passband in order to keep the display as simple as possible. Once this is done, you have things set up for your first spectrogram. Next you want to decide what timeframe you want to show, if you are looking for the on/off times of an RFI source you will need to select a timeframe that covers the start, middle, and ending times plus some time for your time window. Under “Visualization/RF Setup” you will find an option for turning on the slow mode of HDSDR. Select this option, and HDSDR will ask you for a timeframe, I have never figured out exactly how this option decides how long it takes to fill the screen. The documentation says it is the number of minutes, but for me, it never is, for friends it is, so I am a bit lost in how this works. I determined the correct value by experimentation. I would start with 1440 as that is the number of minutes in a day, as that is what the instructions say. If it does not work as expected, don’t worry, just experiment and find out what does. You now have the frequency width, and time span numbers. Write down your settings, you will need them later to repeat things. Next comes setup of the Brightness, and Contrast. Look at the image to the left, and you will see a color band, all setting discussed in this paragraph are within that color band. If you left mouse click the image it will open an additional tab on your browser with a larger version of the image. I next make sure I am set up to show a waterfall in realtime, by unchecking the DISPLAY SLOW SPEED option in HDSDR. At that point the software then begins drawing a standard waterfall in real-time, showing live changes as you adjust the different controls. Adjust the brightness, and contrast controls as outlined below to maximize the display of fine detail in the waterfall Take your time, and make sure the waterfall is showing everything you want. Once you have things looking like you want, the next thing is to switch from fast display mode back to slow display mode, then left click the window resizing icon in the upper right to shrink the window, and re-expand it, that will clear the existing spectrogram, getting you read for a capture run. Once you have this section set up as you like, move on to the “Getting to know the Waterfall” section lower down the page. You will find a bit more on adjusting the noise floor below. HDSDR Noise floor shown in blue. Next adjust the contrast and brightness to just show a touch of noise in the no signal areas of your display. If you took your time in getting a flat noise floor, you will see an even and flat noise across the entire waterfall in the no signal areas. See the blue area in the image to the left. Click the image to expand it. Sometimes it is not possible to get a perfectly flat display, so get it as close as you can. Try and keep the Contrast to as far left as you can, and still get decent visualization of the noise floor by adjusting the brightness. 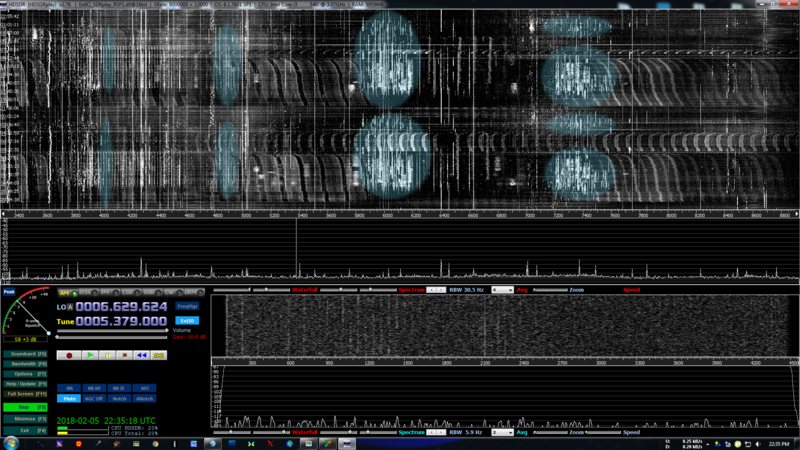 The less contrast you use, the more fine detail will show up in your Spectrogram. Next look at the screen and find the RBW, and AVG controls. They shown at left in the colored band.. The average should be around 4 or 5, this seems a happy compromise between detail and suppressing transient events. You want some averaging to get rid of a lot of the smaller short-term events. Use the RBW control to change the size of the FFT, keep it as small as possible while still getting a good look to the Spectrogram. Why add averaging? If you think about it, RFI is a long-term event, else you would not care about it, it would happen once then be gone… Averaging allows the events that spread themselves over time to show up, while suppressing short-term event from showing up in the display. Events such as a static crash, and single shot items simply are not shown in a display covering so much time. Think of it this way, your RFI is on for hours at a time in most cases, and a few static crashes are on for only a few moments at a time. If you have no averaging, the short-term events will show up with as much intensity as your RFI, but as a sort of fog. If you tell HDSDR to average across a longer time frame, the short-term events are suppressed, and not shown with as much intensity, while the long-term events like your RFI is untouched as far as intensity is concerned. You might ask yourself why not just turn averaging up all the way… If averaging were free that would be a good idea, but like life averaging increases are not free. As you increase averaging, the detail in your RFI starts to disappear. You goal is to hit a happy medium between detail, and averaging. Remember, the more you average, the less detail you get, and vice versa. Now that things are set up, let’s look at what can be learned from an SDR image. I will take a single SDR spectrogram, and using GIMP highlight every item in that period that I know of, and explain what it is. 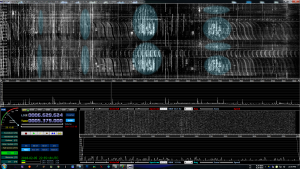 HDSDR Control Overview. Click to expand into a new tab. Take a look at the image above. It is the resultant screen capture of a forty-eight hour period of time, and approximately a five Megahertz spectrum spread. If you click the image above, it will open a second tab in your browser, and you can swap between the image, and this text using the tabs at the top of your browser. First notice that the screen is divided into five different areas. The RF Waterfall, which is where all the action is. 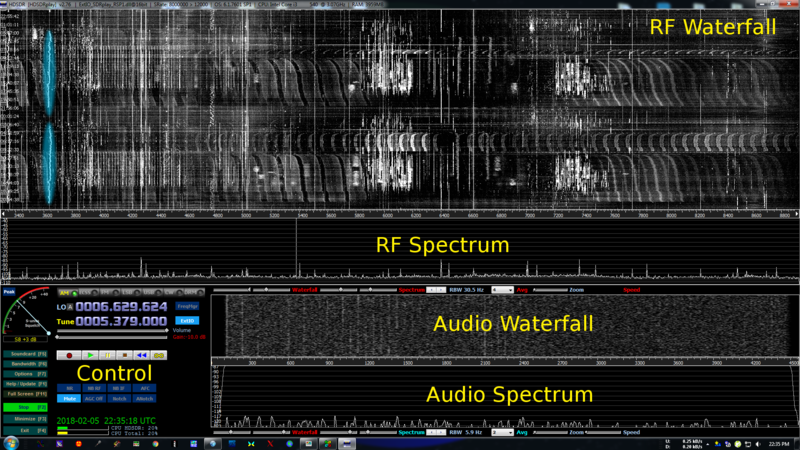 The RF Waterfall of HDSDR shows signals in either a color, or in black and white. I prefer B/W as it seems to show more detail within the RFI. Lighter in color, or brighter, means more signal. Black means no signal. Running vertically the X axis represents time. Two days are shown vertically. If you look carefully you will see the time running vertically along the left edge. Running just below this window is the frequency display bar. It starts at around 3.4 MHz, and ends at around 8.8 MHz., showing a total of around 5 MHz of spectrum. Below that is the RF Spectrogram, it shows signals in realtime, and you can watch things change here during capture runs. It shows signal strength vertically, and frequency along the horizontal axis. The frequency is the same as the RF Waterfall, so the same frequency band display is used. Moving further down the HDSDR display you will find the Audio Waterfall. Again, time runs vertically, and frequency runs horizontally. This waterfall shows the audio you hear, in realtime. The entire waterfall vertically represents something like 45 seconds of time, while the horizontal axis is showing you from 300 Hz to about 4500 Hz left to right. If you set things up as described, this will run in realtime as well, and you will see what you hear here. Next you will find the Audio spectrogram, it shows the Audio in realtime, and like the RF Spectrogram, the vertical axis shows intensity, while the horizontal axis shows frequency. Again, the frequency band running across both of these displays represents the audio spectrum for both. Shortwave broadcasts are highlighted in light blue. Click to expand into a new tab. Looking at the image above you can see a wealth of detail in the RF environment. Remember frequency runs along the horizontal axis, time is represented along the vertical axis, and signal strength is represented by how bright a single dot or line is. 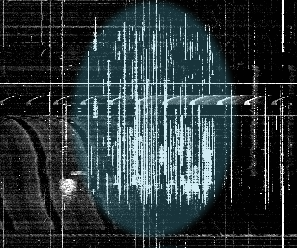 To familiarize you with how I read the spectrogram, let’s start with Shortwave broadcast stations, they are shown with a light blue overlay within the RF Waterfall. Looking at the RF waterfall on the left, (click to expand in a new tab), you can see the light blue area directly above the 6 Mhz. slot on the frequency display. 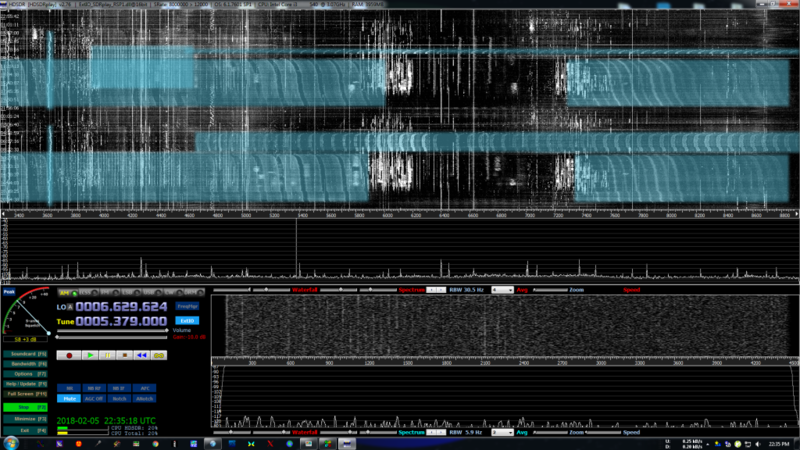 The vertical lines within the highlight area are individual Shortwave broadcast stations. If you follow one of those lines, you can see the start time at the top, the end time at the bottom, and the signal strength of that single station is represented by the brightness of the line. A SW station can start and end for a number of reasons, scheduling, propagation, etc. 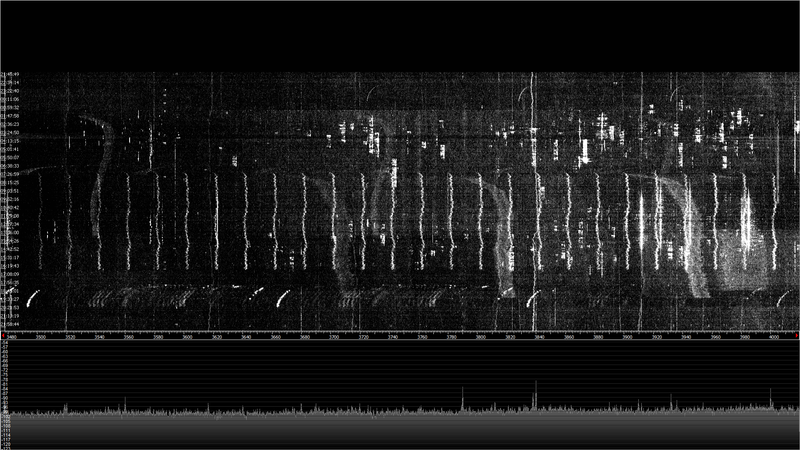 In the spectrogram above, and not to the left, you see that most stations begin at around the same time, but if you look closely, you will see a number of the Shortwave broadcast stations start at the EXACT same time, namely 2300 UTC. This is scheduling causing that relationship. This is important to remember– if you see a number of events starting at the exact same time, they are more than likely related in some way. In this case they are related because the various broadcasters have all decided that propagation is best starting at around 3 PM local time for the coverage into the West coast of the US. You can see that the lines all run vertically, (along the time axis), for around 4 hours. At around 0400 UTC you can see them start to end. Some of this is due to scheduling, (they have all decided that propagation is failing), and have ceased transmissions, and some of this is due to actual failed propagation. If you look at the start times, in the image to the left, you will see that is a lot more ragged than the end time, that means that there were stations transmitting as propagation opened up, but at the end most stations just shut down. All of this analysis of Shortwave broadcast stations was used to illustrate an important concept which you can use for RFI hunting. Things that start at the same time, are related, and it you see many RFI signals starting at once, and ending at once, you can assume they are related, and are not being received via the ionosphere, but directly. Spectrogram showing RFI across 48 hours of time, and 5 MHz of spectrum. Click to expand into a new tab. That source appears to start each day at the exact same time. That source appears to stop each day at the exact same time. That source is on for around 12 hours each day. Continued watching shows that that source goes silent about every 6 weeks. What does this tell me? It tells me that I am probably dealing with an unfiltered grow operation. That tells me a lot for documentation and location purposes, which in turn guides me in documentation for later FCC reporting, and what to look for during the location operations. As soon as I see this sort of pattern I break out S-Meter Lite, (see how S-Meter Lite is used here), and start recording the start/stop times for a few weeks. All of this goes into my RFI log for later use when/if reporting to the FCC, should that become necessary. All the while I am also looking for the source with portable equipment on the ground. Blocked up garage windows on the side of the house. Air handlers on the garage portion of the home. Nighttime light leaks around garage windows, and doors. That alone helps locate, and verify a source. Most times, there is a light leak at night, you can sit down the block from your suspected source and watch the lights come on as the RFI starts. That is a dead give away you have located your RFI source. Again, all of this goes into your RFI notebook for later use if needed. Unknown RFI source, click to expand into a new tab. Now let look at a few other sources… Looking at around 3.6 MHz., and between the hours of 0200, and 2300 UTC, on both days I see another RFI source, it seems to start at the same time each day, and it seems to end at the same time each day. This is probably something on a timer, maybe a grow operation, maybe some Christmas lights, maybe an aquarium heater, maybe someone who is going to bed at the same time each night, and using an electric blanket– who knows. But you can see it does not cover much spectrum, it does not start and stop at the same time each day. I really don’t care about it at this time, as it is not bothering me. Looking between 3.85 MHz., and 3.65 MHz., I see another source that appears to repeat from day-to-day between the hours of about 0600 UTC, and 1600 UTC, but it does not start or end at the same time each day. I will put that one on hold as well, as it is not covering as much spectrum real estate as the first source. Once the first source is gone, I will concentrate on the next source that is bothering me. CODAR transmissions are highlighted in light green. Click to expand into a new tab. CODAR is a radar system used to look at wave height, direction and speed. See this site for more information on CODAR. CODAR normally sits on a single frequency per station, and runs 24 hours a day, looking at the ocean and measuring wave data. The CODAR site then either sends its data to Home, wherever that might be, or saves the data for later collection. I happen to live about 70 miles from the coast, and can see a few CODAR stations in the waterfall. CODAR does not operate within the Amateur bands, so it is not an RFI source for us but it is interesting and useful in understanding D layer absorption. Over the Horizon Radar is shown highlighted in light blue. Click to expand into a new tab. Over the Horizon Radar, or OTH Radar, is used to look for missile launches from a foreign government. OTH Radar is a frequency agile signal that follows propagation. Back in the 1970s, the old USSR had something called the “Russian Woodpecker”, also known as DUGA 3, Over the Horizon Missile Defense Radar. You can get more information on DUGA radar here. The USSR basically did not care where the DUGA radar was transmitting, and used something like 10 Megawatts to look at the United States. This resulted in years of very heavy QRM being caused across the entire 20, 30, and sometimes on 15 meters bands. Sometimes wiping out the entire 20 meter band across the entire daytime side of the planet, for years on end. Thankfully the end of the Cold War brought a great reduction in the USSR reliance on the DUGA OTH Radar system. When the Chernobyl reactor exploded, the final nail was put into the coffin of the DUGA Radar system, and it was shuttered forever. Just time too, the US had was just finishing construction of a system similar to the DUGA system, and in the Oregon desert, not far from my QTH. See this location for more information on that system. The current generation of OTH Radar is just as frequency agile, but not near as wide, or powerful as the old DUGA radar was. The current rumors are that the OTH radar noted above is from China, and does not venture into the ham bands. Although I believe I have seen it at the bottom of 40 meters. All of this serves to show how an SDR can assist me in hunting RFI, as well as aiding me in getting to know both my local and long distance RF environment. I believe that an SDR radio is now an invaluable tool on the fight against RFI, and a tool to help locate RFI by allowing one to select single sources to work with. It allows so much more than just listening to a harsh scratching sound. It allows you to see your entire environment at once, across large periods of time, and frequency, seeing related sources that you would never have related using a portable radio and earphone, while also allowing you to relate widely spaced in frequency sources you probably would not have related. 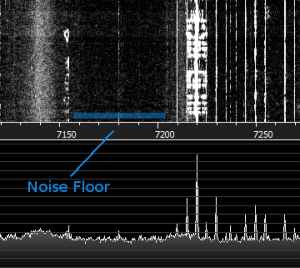 Using a SDR as an adjunct to the standard methods of RFI hunting allows the following by showing you your RFI, as opposed to your having to use your ear to sort out any real structure in the audio. I have found that as I trained others to hunt RFI that I have a pretty good ear for discerning structure within the audio environment, and being able to discriminate between different sources, I also found out that a new person starting out hunting RFI has almost no ear for sorting out structure from the buzzing that RFI generates. Using SDR helps the new person, by drawing a picture of the RFI, and letting them see and hear an RFI source. This leads to a much richer visualization of what is really happening within an RFI environment. Separation of RFI sources at a glance. The ability to relate sight to sound. Linking of sources that cover vast swaths of spectrum at a glance, one would never relate otherwise. The ability to recognize RFI sources that are on timers, and all that implies. The ability to document in a totally unambiguous way your exact RFI environment from day to day. The ability to separate long distance RFI from local RFI. These unique abilities allow myself and others to leverage SDR radio into yet another tool for locating and eliminating RFI. An example– using a loop I can null out a single source, and watch ALL of that single source fade out as I null it in the loop, across many megacycles. This serves to verify the singles source implications of some of the above speculations. I have sold my old Yaesu FT817ND, with the intent of replacing it with portable SDR that has a waterfall on it for use with loops during the RFI hunt process. Currently I use a portable setup I have cobbled together using an SDRPlay and a Raspberry Pi. I need something a bit tighter, and with less wires hanging out of it.